DigitalHeat FX just released a revolutionary new way for screen printers to prepare their screens for short runs faster than ever. Using new Exostencil® Screen Prep Paper, along with your DigitalHeat FX printer, you can now also produce high-quality screens ready to load onto your screen print machine in minutes, rather than hours. The new papers cut down on your need to buy expensive screen printing supplies. If you’re sending away small run orders, you’re sending away MONEY and future opportunities. We know you know what you’re doing with screens.. but what if there was a better way? A way that wouldn’t cost so much on screen printing supplies and labor? One that let you go from graphic to finished screen in MINUTES? Better yet, what if the way to handle full-color small run orders AND produce digital screens in minutes came in the same small package, required no maintenance, and would allow you to do promotional products too? Welcome to the Digital HeatFX Go Digital Package for Screen Printers. 1. A new potential customer walks in the door, or responds to your ad and brings you a small 10 shirt opportunity (substitute your own disappointingly low quantity here). 2. An existing customer comes back for 5 more shirts of that same design you did last month… just as you finish reclaiming the screens. And of course, you HAVE to turn away that business because it’s just not worth it to go through making screens for even a one color design, let alone a 6 or 8 color job. You’ve already PAID for that potential new customer to find you. How happy is that existing customer if you tell them no? Or do you bite the bullet and do the extra 10 shirts at a loss to keep them happy? 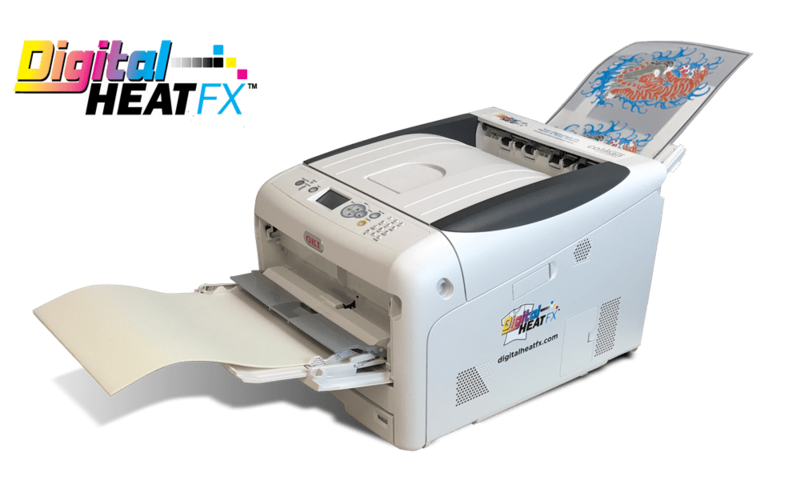 Digital HeatFX is a system based on an led white toner printer. It’s a full color, CMYW printer that prints directly onto a transfer material from a file on your computer. You get great quality transfers that you can apply to a shirt in minutes. And you can apply that transfer to almost any fabric. The printer is sized so that it can sit on your desk next to the heat press. And, it has some great advantages for producing small runs in either full-quality digital color. And with the new system, you can produce great looking prints on your screen printing press as well. There’s no need to talk your customer DOWN on the number of colors because it doesn’t care how many colors are in the design. Click to call 855-348-4839 for your custom quote. Load the graphic into the Print Optimizer software. Resize it, duplicate it for gang printing, color adjust if you need to. Marry the transfer on the heat press. Total elapsed time from print to finished garment under 5 minutes. Of course, you do pay more for each transfer or completed shirt than you do if you would have screened it – but DigitalHeat FX users average a MUCH higher sale price than most screen shops because they can offer full color, while you wait, fast turnaround. That’s easy. Because it amazingly allows you to make SCREENS just as quickly and easily as you can make full-color transfers. The DigitalHeat FX Go Digital Package doesn’t just come with our Laser EZ Peel universal transfer paper – it comes with this little piece of magic from Neenah called the EXOSTENCIL. And the system will reduce your overall need for screen printing supplies. You’re done. Go screen print that big order. No Other Prep at All! Now how do you feel about small screen printed jobs? Your labor cost for prep is merely the 5 minutes or so to make the screen. Your materials cost is the screen itself, which you will reclaim like normal, plus the same low ink price per print you’re calculating now. No expensive UV blocking inks required. Also no chemicals, no smells and maybe best of all no special SKILLS needed. Offer existing customers full-color short runs; you’ll be adding value to the relationship and keeping all their business in-house. Advertise that you do short runs. And charge accordingly. You’ll be amazed. There are 10s of thousands of shirts sold using DigitalHeat FX transfers for $25 each and up. Add hard goods and promo products EASILY to your product line up. (offer full-color koozies, they’re money makers. START USING EXO SCREENS: There’s just no struggle here. You can turn around a perfectly good screen in 5 minutes. You can shut the door to that dark room… and everything that comes with it. Need some help around the shop? Anyone can learn to print screens with DigitalHeat FX. Ready to talk to a pro about finally getting your business to Go Digital? Your next step starts with chat below, call 855-348-4839 or contact us for more information here.